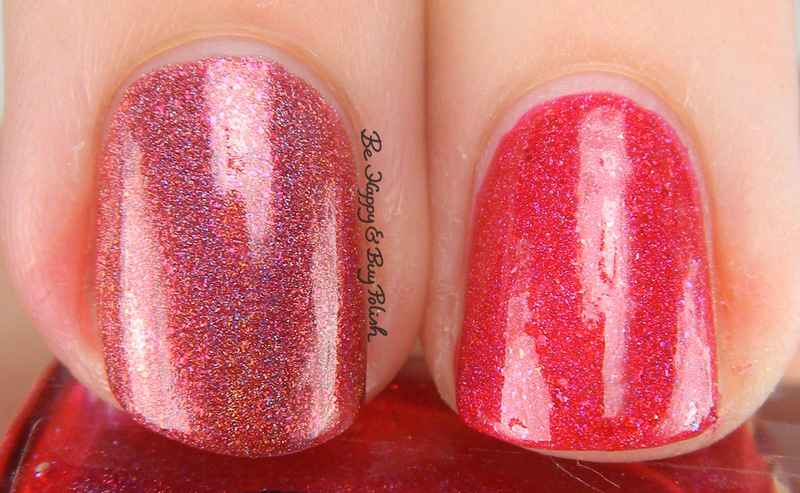 Cinnamon Twist is a burnt red-pink nail polish with red shimmer. This is 2 coats plus top coat. I really love the fall vibe to this, it reminds me of falling red leaves. Formula on this was great, first coat a bit sheer, second coat finished off perfect. If you’re wondering how CT compares to last year’s Caramel Apple Orchard, here you go! This is 2 coats of CT and 2 coats of CAO. Next is Sour Caramel Apple, a green holographic nail polish with a mix of green & gold flakes. And yes, this is the perfect shade to the caramel apple suckers. This is 3 coats plus top coat. Formula on this was a bit thick, and I needed 3 coats to level it out. Here is SCC compared to last year’s Trick or Mint (3 coats plus top coat). As you can see, ToM is much lighter and more sheer. Now we have Cotton Candy Creature, a red-tone based purple polish with pink and purple flakes. This is 2 coats plus top coat. I think with the reddish tone to this makes it great for fall weather. Formula was good, sheer on the first coat, leveled off nicely on the second coat. I compared this to last year’s Pop Rock Panic (3 coats plus top coat), but they are nothing alike. Next is Marshmallow Pumpkin, a bright orange holographic nail polish with peach and pink flakes. This is 3 coats plus top coat. When I first received this, I was really unsure that I’d like it. I’m still on the fence but it is a pretty polish! Formula was a bit thick and needed a third coat to level out. Last is Black Licorice Bats, described as “a soft gray holographic with a mix of pink and purple flakes.” Personally, I see this as a blackened purple myself. This is 3 coats plus top coat. I’d love to know your favorite out of these 5 – I’m pretty sure mine are Cotton Candy Creature and Black Licorice Bats. All 5 of these are available right now on pahlish.com and so are last year’s 5 polishes! great macros! I’m so happy after reading your post — my faves are the same as yours, and those are the 2 that I ordered. After seeing your macros, I’m so pleased that I got them both! These are just so amazing! Glad I bought them. All of them are super pretty! I’m a Pahlish lover as well- this is such a fun and colorful collection! I’m sooooo bummed I had to miss out on most of these 😦 At least I got the green and orange!! Love the comparisons, by the way!! Oh my these are really beautiful!! Sour Caramel Apple is my favorite! Black Licorice Bats is stunning!! I need it.